July 2016 Horoscope forecast for Scorpio suggest that your business and job will take up your time this month. You should concentrate on career and personal objectives by working harder. Professional environment is hectic and you will face stiff challenges. July 2016 is a month where both independence and social skills are necessary for the Scorpions. You should be flexible enough to adjust yourself to the changing situations. Collaboration with co-workers and flexibility is still essential. Scorpio, Your home and family planet Uranus is not favorable and all major decisions regarding personal relationships should be avoided in July 2016. Interest in higher education may take you to foreign lands and you will have opportunities for learning about new cultures. Students studying religion and philosophy will be better aware. The Scorpio horoscope for July 2016 predicts that professionally this is a good month. There will be career development with improvement in rank. Your hard work will be acknowledged and you will be rewarded with financial benefits. Bold decisions and actions in business are necessary. Scorpios seeking employment will get a chance in July 2016 and the employed ones may see unexpected changes. You may see drastic changes in your profession in the beginning of the month. 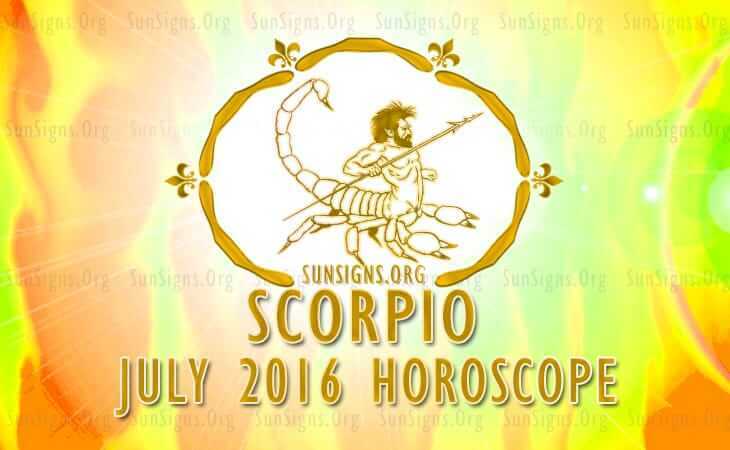 Monetary situation will get better for the Scorpio zodiac sign in July 2016. Your financial instinct is more robust. Projects in the pipeline will start moving forward. Generation of money will be smooth till the end of the month. You will become wealthy by your diligence and intelligence. The 2016 horoscope predicts that lot of compromise is necessary for the Scorpios in affairs of the family. Your social activities will strain the relationship with your spouse. Very strong differences of opinion with your spouse will vitiate the atmosphere. Talks about pregnancy is better avoided. Your financial efforts will not be supported by family members. If you can overcome all these conflicts, family life will become better. Until the mid of July 2016, love will be more passionate and after that it will be more spiritual. Single Scorpios will be able to form new partnerships and existing partnerships require reassessment. Love is to be found in universities, overseas or with foreigners or in spiritual environment. The Scorpio astrology predictions for July 2016 suggest that health will be delicate throughout the month. You need to be avoid being moody or mentally stressed out. Your tendency to disregard health problems may create serious situations. Try these simple home remedies if you do not want to visit a doctor. To conclude, the July 2016 monthly predictions for Scorpio foretell a professionally positive month which might affect your family life.